Guy Atkins and I managed one of our brief Grayland DXpeditions to celebrate the end of summer and to try to catch the local IDs of the pesky NHK-2 synchronous stations on 702, 1125, 1152, 1377, 1386, 1593 and 1602. 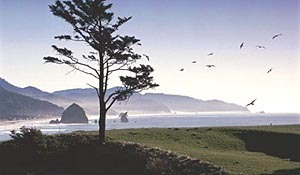 The latter weeks in August are one of the few times of the year that the local IDs on NHK-2 network at 1320UTC coincide with dawn enhancement on the Washington coast. As usual, we traveled to Grayland (two to three hours from Seattle-Tacoma and unlike those Puget Sound locations, on the open Pacific coast of Washington State) on Thursday afternoon and got the three beverages out and our receivers up prior to sunset. It was then to early bed so that we could arise at 2:30AM local time (0930 UTC) when the sunset terminator had traveled across the central Pacific. The period 0900-1100 UTC is generally the time that we hear the nations of the Pacific, if the DX gods are smiling. In recent years, this middle of the night exercise has generally been fruitless.... for reasons we don't really understand. After 20 minutes of band scanning, Sack Rat Bryant generally headed back to bed for another two hours of shut-eye, while Guy continued to turn the knobs. His persistence was rewarded by brief receptions of 1035 Solomon Islands, the 1 kw Kosrae, FSM outlet on 1503, and 1098 Marshall Islands. Our first morning saw the conditions until actual dawn (1314 UTC) focused almost exclusively on Japan and Korea, with China noticeably absent. Almost all of our catches during this period tended to be high-band stations. Very soon after actual dawn, the Japanese/Koreans fell away and the lower part of the dial was literally covered with Aussies. Uniquely, about 80 percent of these stations (the ABC Metropolitan Service and ABC "Local Radio" a.k.a. RR "Rural Radio" Service) were running the same ABC Olympic coverage. This allowed us to identify quite a few of the stations by inference a least, very rapidly. Handily, ABC's National Radio Service was running a very distinctive World Music program, further improving our chances of inferring station IDs. Best catches were 639, 8RN Katherine in Northern Territories, Australia and a local ID on one of the NHK-2 Synchros, JOTB, Matsue on 1593. Other notables were 1035 Radio Hapi Isles, Honiara, Solomon Islands and a couple of non-regular Korean stations. The swap from Northern to Southern Hemisphere a few minutes after dawn was really remarkable. The first half of dawn enhancement was a bit more broadly cast than our first morning, with New Zealand stations, primarily deep South Island stations present at the same time as Japan and Korea Unlike the first morning, major Chinese outlets were also noted during this first half of dawn enhancement. Like Friday morning, conditions abruptly switched to Australia at about local dawn here in Grayland. Again, ABC Olympic programming seemed to cover the lower half of MW. Another distinguishing characteristic of Saturday morning was the return of truly "local level" signals on some of the Big Gun stations. VOA Thailand, 1575, China National Radio's Korean Service on 1206 and FEBC's HLAZ, Cheju Island, Korea on 1566 were each well over S-9 during the heart of dawn enhancement. The more notable loggings included 675 3YA Christchurch and 864 4ZA Invercargill, NZ and 540 4QL Longreach, QSLD under the vestiges of CBK, Regina at the end of max. dawn. Our last morning, though offering some wonderful DX, was much more what we expected to find during "summer conditions:" at Grayland: conditions focusing on Down Under, with a scattering of loggings from the Pacific Islands. It must be said, though, that the quality of the conditions was much more like the Glory Days of the early 1990s. We made some memorable catches and also got to revisit several long-absent old friends. Among the more memorable catches were TWO presumed Northern Territory loggings, 8RN, Katherine-639 again and 8AL, Alice Springs-783. Another tantalizing very tentative was mega-watt AIR Chinsura-594. We also celebrated 666-Radio Nouvelle Caledonie, Noumea heard very well for our first logging of this old friend in a decade. Our July 2004 visit to Grayland produced the poorest MW loggings from there in many years. This visit, five weeks later, produced some of the very best. What a fascinating hobby. Some DXers "hang up the headphones" in the Summer, figuring that there is no DX worth pursuing. My experience, though, says otherwise. Especially from a quiet DXpedition location, every month of the year offers opportunity for interesting targets. 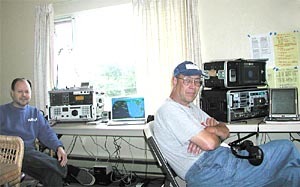 This weekend's 3-night DXpedition at Grayland with John Bryant produced trans-Pacific MW DX from both hemispheres. The geographic regions that were "in" at any given moment toggled from one to the other within a minute or two. It would be fascinating to know what propagational mechanism causes DX to begin the evening "Down Under", flip suddenly to Japan/China/Asia for much of the night, and then finish with a sudden return to Aussie/Kiwi mediumwave DX just past local sunrise! Please see John's DXpedition report for an interesting and detailed account of these fluctuating conditions. Sunday, August 22nd provided a totally different mediumwave reception pattern compared to the previous evenings. Once the grayline had shifted far enough to the west, both Southern and Northern hemispheres propagated signals to our receivers. On frequencies such as 594 and 828, Australian/New Zealand and Japanese/Korean/Chinese stations were fighting for our attention at the same time. Overall signal levels were lower on the 22nd, often making it difficult to identify anything more than the languages and potential countries on the frequency. My DXpedition highlights on mediumwave were the 1 kw Kosrae, Micronesia station V6AJ on 1503 (a new MW country for me) and catching an elusive local ID of JOTB Matsue, Japan on 1593. I spent little time on the tropical bands as mediumwave was so productive. Most interesting catch on shortwave was an unidentified NHK feeder on 3970 USB, which is likely the 600 watt Sapporo station rather than the weaker, further south Nagoya outlet. The usual Indonesians on 90 meters such as RRI Palangkaraya and RRI Ternate provided excellent listening with their strong, clear signals. I also found Radio East New Britain (3385 kHz) on late past 1200 with an excellent quality broadcast of the "New Guinea Top Ten Countdown" of Melanesian pop music, sponsored by Coca-Cola. A number of advertisements, promos, and PSAs added to the local flavor. MP3 recordings of this intercept can be streamed or downloaded from here (26 minutes, 3.05 Mb) or just the first half (13 minutes, 1.54 Mb). The MP3 files are analog copies of my original minidisc recorded on the ICOM R-75. John and I set up our usual three Beverage antennas on this DXpedition: 750 ft. terminated wires running southwest and west, and 950 ft. in the northwest direction. We also experimented with a remotely-adjusted termination for another western Beverage. The orientation of the Grayland DXpedition site limits our antenna lengths. In the past we've extended the wires a few hundred feet further over the beach during the night but found no worthwhile improvement; the risk of the wires being caught by passing vehicles on the beach is too great. My ICOM R-75 was my favorite receiver during the DXpedition, and it proved to be more flexible in tough DX situations than the Racal RA6790GM. The ICOM was better with split frequency MW signals thanks to the INRAD crystal filters in the 2nd & 3rd IFs which improve the R-75 twin PBT control's performance over stock. On the trans-Pacific MW catches in particular, once again I found myself wishing for PBT on the Racal. The RA6790GM has great selectivity, but the R-75 has an edge in audio recovery and signal readability with its PBT adjusted precisely. The PBT's superiority is due to its ability to peak crucial voice frequencies for best intelligibility, when signals are severely overlapping (often the case with foreign mediumwave stations close to domestic MW channels). The R-75 is also easier and quicker to tune than the RA6790GM, with the ICOM's keypad buttons providing a tactile feedback compared to the membrane keys on the Racal. In addition, if I want to use the full selection of voice bandwidth crystal filters in the RA6790GM I need to be in CW mode, adjust the BFO to 1200-1500 kHz, and offset-tune by an appropriate amount for clear audio. On signals without co-channel interference however, the Racal is my first choice for cleaner audio. Particularly with very weak signals having at least one sideband in the clear, the RA6790GM reveals more nuances of the audio for better intelligibility. The Racal is also my first choice for pleasant program listening to moderate and strong signals.